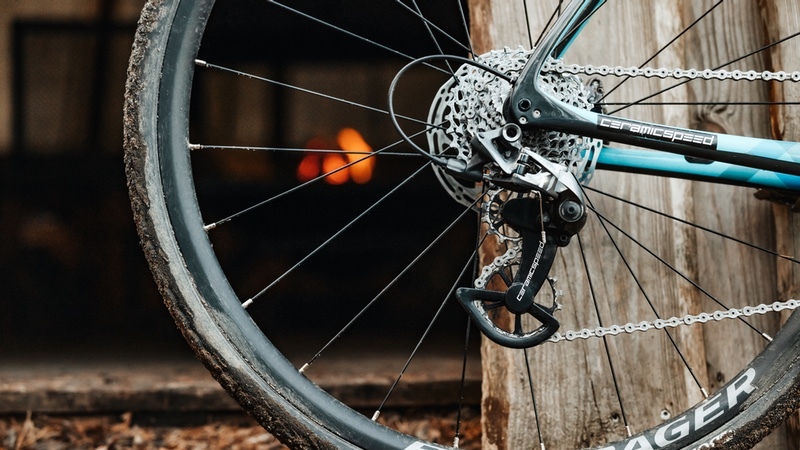 Danish drivetrain efficiency and ceramic bearing specialists, CeramicSpeed has unveiled its latest off-road product specifically for cyclocross and gravel bikes, OSPW X for SRAM 1x derailleurs. The product has been in development since summer 2018 – with ‘a period of rigorous testing with Tom Pidcock and former pro cyclist Mads Christensen’. Launched at VeloFollies, the largest cycling fair in Benelux, the X Series is said to ‘define a new era for CeramicSpeed’. The new oversized pulley wheel combines CeramicSpeed bearings with ‘innovative engineering to create products specifically designed to endure the harshest conditions’. Commencing with the new OSPW X for SRAM Rival and Force 1 Type 3, the X Series claims to establish a new category of product development for off-road cycling. The OSPW X is the first oversized pulley wheel system available on the market compatible with a clutch derailleur. Previous testing demonstrated that clutch derailleurs have higher drag than a non-clutch derailleur. Yet, through lowering the spring tension (as CeramicSpeed does with the OSPW X), the company adds that the efficiency gap can be reduced. At the same time, while retaining the overall benefits of the clutch (chain retention on rough roads and 1X chainring setups), CeramicSpeed claims 30-40% less friction than conventional systems. The effect is the clutch is a separate function from the backwards spring tension, so each can be adjusted separately to reduce chain drag. ‘Unlike other recent entrants to the market’ the CeramicSpeed OSPW X incorporates a carefully designed and tested pulley tooth profile with a narrow/wide design for durability and shift quality. The new OSPW X features a custom-designed carbon fibre pulley cage assembly that is lightweight and durable. Designed, developed and hand built in Denmark, with CeramicSpeed bearings inside, the OSPW X comes with a warranty of up to six years and gives a claimed three to five times longer lifetime over a conventional pulley wheel system. Developed in response to requests from riders and seen as a natural progression of both the OSPW Systems and off-road categories, the OSPW X for SRAM Rival and Force 1 Type 3 is now ready to ship. A wide range of cyclocross professionals and gravel enthusiasts fed into the project, including extensive testing with former WorldTour professional Mads Christensen and Tom Pidcock, the new UK Elite Men’s Cyclocross National Champion. From off-road specific pulley wheels, durable bottom brackets to a bottled chain coating that ‘excels in off-road conditions’, CeramicSpeed has built up a collection of products for all-terrain applications. With sponsored athletes and teams such as GHOST Factory Racing, Centurion Vaude, TP Racing and a number of past Cape Epic victories, the CeramicSpeed products have been making a difference for many years in the off-road arena. Under the mark of the X series, CeramicSpeed is now looking to take the same advantages to all off-road riders, worldwide.